I saw on your site that you were trying to find pictures of the statue in Germany. Apparently the fellow from "in the doghouse" wasn't able to find anything. 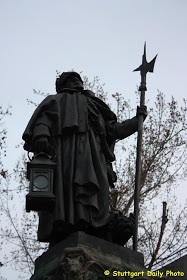 There is a statue called the night watchman in Stuttgart with what does appearto be a schnauzer at the main subject's feet. I couldn't find a way to contact the fellow with the other site, and this was the only way I found I could write to you. I can be reached at donaldhardy@yahoo.com. The picture is from a website about Stuttgart. Comments for Statue in Germany. Thanks for sharing that, very interesting. The dog could be a Schnauzer. Unfortunately we no longer have contact details for In the Doghouse, so cannot pass on your email address.